Observed by Religiously by Hindus, Sikhs and Jains. Other Indians celebrate the cultural aspects. Diwali, also called Deepavali, known as the "Festival of Lights," is a major Hindu festival that symbolizes the victory of good over evil. In North India, Diwali marks the time when the Hindu God Rama achieved victory over the demon Ravana. Celebrations of this event involve lighting lamps and fireworks to symbolize hope and restoration. Diwali is celebrated for five consecutive days at the end of Hindu month of Ashwayuja. It usually occurs in October/November, and is one of the most popular and eagerly awaited festivals in India. Hindus and Sikhs alike regard it as a celebration of life and use the occasion to strengthen family and social relationships. Diwali being a festival of colors, across India people celebrate it via symbolic diyas or kandils (colorful paper lanterns) as an integral part of Diwali decorations. The festival is worshiped on the same set of days across India but the annual dates change according to the lunar cycles. The Amantnm ("ending on the no-moon") version of the Hindu Calendar has been adopted as the Indian national calendar. According to this calendar, Deepavali falls in the middle of the month of Ashwayuja. According to the Purnimanta ("ending on the full-moon") version prevalent in northern India, the 5-day celebration is spread over the last three days of the month of Ashwayuja and the first two days of the new month of Kartika. In this calendar, the festival of Diwali marks the new year's day and is therefore an especially significant. In South India, Deepavali does not coincide with the beginning of a new year as South Indians follow a different calendar, the Shalivahana calendar. Nevertheless, the holiday still falls in the same period, which usually coincides with the months of October or November in the Gregorian calendar. Diwali is celebrated over five days in most of North India. All the days except Diwali are named using the designation in the Indian calendar. A lunar half-month is 15 days. Diwali as a new-moon day, marks the last day of a 15-day period. Dhan-trayodashi or Dhan teras: Dhan means "wealth" and Trayodashi means "thirteenth day." Thus, as the name implies, this day falls on the thirteenth day of the first half of the lunar month. It is an auspicious day for shopping (Gujarati: Dhan Teras). Naraka Chaturdasi: Narak means 'of a new era of Light and Knowledge'. Chaturdasi implies fourteenth day (Gujarati: Kali Chaudas).In Southern India, naraka chaturdasi is the main day, with firecrackers at dawn. Diwali: the actual day of Diwali, is celebrated on the third day of the festival, when the moon completely wanes and total darkness sets in the night sky. Varsha-pratipada or Padwa: Beginning of the New Year (Kartikadi Vikram). Pratipada means the first (Gujarati: Bestu Varas). Bhayiduj (also Bhayyaduj, Bhaubeej or Bhayitika) — on this day, brothers and sisters meet to express their love and affection for each other (Gujarati: Bhai Bij, Bengali: Bhai Phota). In Singapore, Diwali is marked by 2 kilometers of lights across the Little India area. 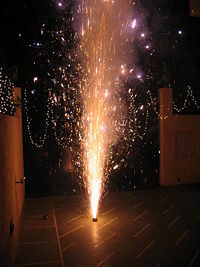 A typical Indian household celebrates Diwali with fireworks. In Sanskrit, the word Deepavali means an array of lights that stands for victory of brightness over darkness. However, as the knowledge of Sanskrit diminished over the centuries, the term was modified to Diwali, especially in northern India. To this day, Diwali is the common name used by North Indians for the festival while South Indians call it Deepavali. However, the meanings of both terms are identical: "row of lights." While Diwali is popularly known as the "festival of lights," its most significant esoteric meaning is "the awareness of the inner light." Central to Hindu philosophy is the assertion that there is something beyond the physical body and mind which is pure, infinite, and eternal, called the Atman. Just as we celebrate the birth of our physical being, Diwali is the celebration of this Inner Light the knowing of which outshines all darkness (removes all obstacles and dispels all ignorance), awakening the individual to one's true nature, not as the body, but as the unchanging, infinite, immanent and transcendent reality. With the realization of the Atman, comes universal compassion, love, and the awareness of the oneness of all things (higher knowledge). This brings Ananda (Inner Joy or Peace). Diwali celebrates this through festive fireworks, lights, flowers, sharing sweets, and worship. While the story behind Deepavali varies from region to region, the essence is the same—to rejoice in the Inner Light (Atman) or the underlying reality of all things (Brahman). In North India, Diwali is most popularly celebrated as the return of Lord Rama, King of Ayodhya, with his wife Sita and brother Lakshmana to Ayodhya from a war in which he killed the demon king Ravana. It is believed that the people lit oil lamps along the way to light their path in the darkness. This is the reason, why the festival is celebrated a day earlier in South India since Lord Rama traveled from the south to his kingdom in the north. In North India, the festival is held on the final day of the Vikram calendar. The following day marks the beginning of the North Indian new year, and is called Annakut. In South India, Diwali (known as "Deepavali") is sometimes assocaited with the divine pair of Shiva-Shakti. According to the Skanda Purana, the goddess Shakti observed 21 days of austerity starting from ashtami of shukla paksha (eighth day of the waxing period of moon) to get half of the body of Lord Shiva. This vrata (vow) of austerity is known as kedhara vrata. Deepavali is the completion day of this austerity. This is the day Lord Shiva accepted Shakti into the left half of the form and appeared as Ardhanarishvara. The ardent devotees observe this 21 days vrata by making a kalasha with 21 threads on it and 21 types of offerings for 35 days. The final day is celebrated as kedhara gauri vrata. Diwali is also sometimes associated with the killing of the evil demon Narakasura by Krishna's wife Sathyabhama. According to Hindu mythology, this event happened in the time of the Dwapara Yuga. In another version, the demon was killed by Lord Krishna himself. Before Narakasura's death, he requested a boon from his mother, Sathyabhama, that everyone should celebrate his death with colorful light. In Bhavishyottara and Bramhavaivarta Purana, Diwali is associated with the Daitya king Bali, who is allowed to return to earth once a year. To add to the festival of Diwali, fairs called Melas are held throughout India. A mela generally becomes a market day in the countryside when farmers buy and sell produce. Girls and women dress attractively during the festival. They wear colorful clothing, new jewelry, and their hands are decorated with henna designs. Among the many activities that take place at melas are performances by jugglers, acrobats, snake charmers and fortune tellers. Food stalls are set up, selling sweet and spicy foods. There are a variety of rides at the fair, which include Ferris wheels and rides on animals such as elephants and camels. Another attraction is the puppet shows that are offered throughout the day. It is also a tradition to dance in the streets. Sikhs celebrate Diwali to commemorate the laying of the foundation stone for the Golden Temple in 1577. It is also remembered as the auspicious time in which the Mughal emperor Jahangir released the Sikh Guru Hargobind from his imprisonment in Gwalior. To the joy of the Sikhs the Guru returned to Amritsar on Diwali and it prompted the followers to celebrate the day with joy and happiness. During Diwali, the Sikhs illuminate their Gurdwaras and homes with earthen oil lamps or candles. Early in the morning, Sikh pilgrims in the city of Amritsar take a dip in the sacred tank while reciting Japji Sahib, and then they pray at the Golden Temple. According to Jain tradition, Lord Mahavira, the last of the Jain Tirthankaras, is said to have attained Nirvana on this day at Pavapuri. The oldest use of the word "Diwali/Dipavali" occurs in Harivamsha-Purana written by Acharya Jinasena, composed in Shaka Samvat 705"
Thus people in Bharata every year celebrate famous "Dipalikaya," to reverently worship the Jinendra on the occasion of his nirvana on the amavasya of Kartika month. However, the way Jains celebrate Diwali is different in many respects and involves an element of asceticism. The Jains celebrate Diwali during the month of Kartik for three days. During this period, among the Shvetambaras, devoted Jains observe fasting and chant the Uttaradhyayan Sutra, which contain the final pravachans of Lord Mahavira, and meditate upon him. Finally, Mahavira's chief disciple, Ganadhar Gautam Swami, is also alleged to have attained complete knowledge (Kevalgyana) on Diwali, thus making the day a very special occasion for the Jains. The Divali Nagar or Divali village in Chaguanas, Trinidad and Tobago. With more and more Indians now migrating to various parts of the world, the number of countries where Diwali is celebrated has been gradually increasing. While in some countries it is celebrated mainly by Indian expatriates, in others it has become part of the general local culture. 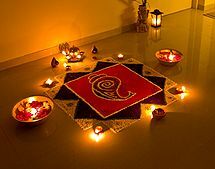 Diwali is celebrated in the following countries: Australia, Canada, Fiji, Guyana, India, Indonesia, Japan, Malaysia, Mauritius, Myanmar, Nepal, Netherlands, Singapore, Sri Lanka, South Africa, Suriname, Thailand, Trinidad and Tobago, United Arab Emirates, United Kingdom, and the United States. In most of these countries Diwali is celebrated on the same lines as described in this article with some minor variations. Some important variations are worth mentioning. In Nepal, Diwali is known as "Tihar" and celebrated during the October/November period. Here the festival is celebrated for five days and the traditions vary from those of India. On the first day, cows are given offerings, in appreciation of the food they have given and agricultural work they have performed. On the second day, dogs and all living animals are revered and offered special food. On the third day, celebrations follow the same pattern as in India, with lights and lamps and much social activity. On the fourth day, Yama, the Lord of Death, is worshipped and appeased. On the fifth and final day, brothers and sisters meet and exchange pleasantries. In Trinidad and Tobago, communities all over the islands get together and celebrate the festival. 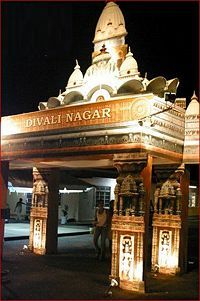 One major celebration that stands out is the Divali Nagar, or Village of the Festival of Lights. It features stage performances by the east Indian cultural practitioners, a folk theatre featuring skits and plays, an exhibition on some aspect of Hinduism, displays by various Hindu religious sects and social organizations, nightly worship of Goddess Lakshmi, lighting of oil lamps, performances by various schools related to Indian culture, and a food court with Indian and non-Indian vegetarian delicacies. The festival culminates with magnificent fireworks displays ushering in Diwali. Thousands of people participate in an atmosphere typically devoid of alcohol and in a family environment. In Malaysia, Diwali is known as "Hari Deepavali," and is celebrated during the seventh month of the Hindu solar calendar. It is a federal public holiday throughout Malaysia. In many respects it resembles the traditions followed in the Indian subcontinent. "Open houses" are held where Hindu Malaysians welcome fellow Malaysians of different races and religions to their house for a sumptious meal. "Open house" or "rumah terbuka" is a practice very much unique to Malaysia and shows the goodwill and friendly ties practised by all Malaysians during any festive occasion. In Singapore, the festival is called "Deepavali," and is a public holiday. Observed primarily by the minority Indian community, it is typically marked by a light-up in the Little India district and is most known for the fire-walking ceremonies not practiced as part of the festival in other countries. The Hindu Endowment Board of Singapore along with Singapores' government organize many cultural events around Diwali time. In Sri Lanka, this festival is also called "Deepavali" and is celebrated by the Tamil community. On this day, it is traditional for people to wear new clothes and exchange pleasantries. Diwali is an annual stimulus for the Indian economy. Indians purchase gold, gifts, decorations, fireworks, and household appliances during this festival. Additionally, many Indian films (from "Bollywood") are released during this period. Companies offer huge discounts during the Diwali season to attract customers, which help the economy. Food distributed as acts of charity during community festivities also helps the underprivileged and poor. Diwali also brings tourists to the country. Schools in India are closed during this festival, and many young people buy new clothes to wear during Diwali. The North Indian business community usually starts their financial new year on Diwali and new account books are opened on this day. ↑ Diwali Festival, Hindu Janajagruti Samiti. Retrieved October 10, 2014. This page was last modified on 17 October 2017, at 22:07.